This book was designed with teachers in mind! 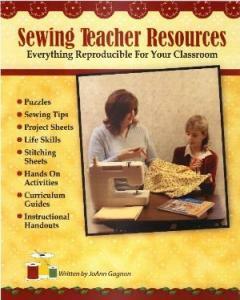 Sewing Teacher Resources is a book you can use in your own classroom - whether that classroom is 1 or 20. It provides you ready made materials, classroom handouts, projects and curriculm guides to save you time and energy. Kids learn in many ways. Use these pages with your students to reinforce concepts previously taught and make learning easier for children with different learning styles to grasp. Sewing Teacher Resources has tips and tricks that make passing on your love of sewing fun and easy. With puzzles to help reinforce what has been learned to handouts that make teaching sewing a breeze and hands on activities that are lots of fun, this book will also show you how to use the other books from Bunkhouse Books, as a curriculum for your students. With 40+ years in the sewing room, JoAnn has gathered a lot of experience with sewing and teaching kids and adults the how to's of building and teaching life skills that matter.